THE BURREN CENTRE AND THE KILFENORA CEILI BAND PARLOUR. 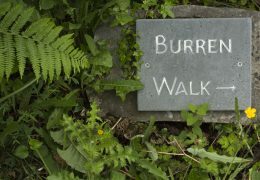 Discover the unique magic of the Burren Region in ‘A Walk-Through Time’ at the Burren Centre. 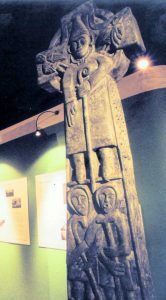 The visitor centre in the historic village of Kilfenora boasts a fantastic exhibition, audio visual film theatre, local craft shop and tea room. The Burren with its innate sense of spiritual peace has an extraordinary array of flora and wildlife, megalithic tombs and monuments older than Egypt’s pyramids. This story is excitingly captured and impressively presented in “A Walk-Through Time” a multi-dimensional exhibition. Beautifully displayed artefacts, original works of art, enthralling audio visual and interactive experiences together with dramatic life like reproductions of human activity all combine to provide an insight into the rich history of the Burren. 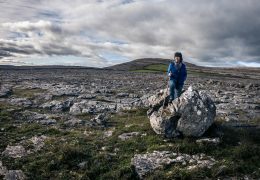 After a visit to The Burren Centre it is hoped that visitors would be better prepared to interpret and understand the landscape through which they travelled and so gain a deeper appreciation and respect for this stone carved land. 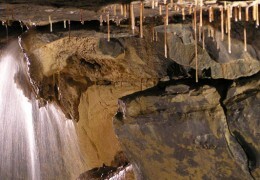 This journey through time will take you back through millions of years when this area lay beneath a warm tropical sea. Follow the story of the formation of the Burren’s lunar landscape where man hunted bear, and wolves roamed the forests. See how, thousands of years ago, man left his mark on the landscape in the form of Dolmens and burial chambers. Like the world famous Poulnabrone Dolmen they still stand today, stone sentinels at the gates of our civilisation’s history. On your visit to the Burren Centre, you will also be invited to view a comprehensive film by the late world-renowned environmentalist and much-admired film producer, Eamon de Buitlear. Discover how the limestone pavement was formed, and why Alpine, Artic and Mediterranean plants which require different climatic conditions grow side by side in such abundance on the fertile rock. He splendidly covers in film the unique interaction of the Burren’s seaboard with the Atlantic Ocean. The Burren is one of the few areas in the world where a karst environment interacts with an Ocean. The submarine life is wonderfully portrayed at the beginning of his film. True to the spirit of the European Community the presentation is available in six languages. The Centre is built beside the famed Kilfenora Cathedral. This Cathedral was dedicated to St. Fachnan and built in about 1189 on the site of an early monastery. Kilfenora, known as the city of the High Crosses, boasts one of the greatest concentrations of high crosses in Ireland, including the famed “Doorty Cross”. Not only has this picturesque village its own medieval Cathedral but can also claim the Pope as Bishop. The Cathedral is of architectural interest and contains some fine carvings, on grave slabs and on windows and doorways in the form of stone heads. A homely Tea Room awaits you at the end of your “Walk Through Time” where you can enjoy the delights of fresh, home-cooked food. The Kilfenora Ceili Band Parlour provides a unique opportunity to trace the music and history of the internationally renowned Kilfenora Ceili Band. With the help of top of the range visual displays, artefacts, musical instruments, artwork and acoustics the music of The Kilfenora Ceili Band will visually and aurally come to life before you. The exhibition is in an intimate setting and will take you on a rare musical treat of the music of the new and old band. If you plan on visiting the Burren region, this is a musical journey of discovery not to be missed, it has to be experienced! Mid-March, April and May 10.00a.m. to 5p.m. June, July and August 9.30a.m. to 5.30p.m. September and October 10.00a.m. to 5p.m. Services: Tourist Information Point, Ample free parking beside Kilfenora High Crosses, all Burren reference Maps & Guides available in our spacious craft shop.